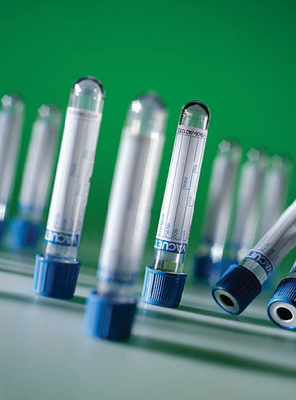 Designed for use in the examination of coagulation parameters, coagulation tubes contain a buffered tri-sodium citrate solution. Citrate concentrations of either 3.2% (0.109M) or 3.8% (0.129M) are available, with a mixing ratio of one part citrate to nine parts blood. VACUETTE® tubes are manufactured from virtually unbreakable PET plastic. These clear tubes are supplied with blue non-ridged pull caps that feature an exterior color-coded ring to indicate the draw volume. A black ring indicates standard tubes and a white ring indicates a tube designed to accommodate pediatric draw. High altitude tubes are recommended for use in locations 5,000ft. or higher above sea level.